I went up to Boston (again) to celebrate a friend’s Birthday and to try and catch up to an important package…and true to form the city sucked me in again. One day turned into three but it was a great three days so I guess I wont hold it against Boston. Here’s the quick outline. Friday found me running down the middle of a street with a backpack full of technology and holding a door above my head trying to get to a park before the “Surprise!” portion of a Surprise Party. Saturday was chock full of one adventure after another. Highlights: I spent several hours at a beer tasting with some of my favorite Bostonians and learned more than I’ll ever be able to remember about New England craft breweries. One thing I won’t forget…Haverhill brews taste like rancid lemonade (just to clarify: that is definitely NOT a compliment). It was a great time and really well organized. Seventy-five different beers were out and I met a TON of interesting people. There’s a lot of video to go through but hopefully I’ll have another quick and dirty cut up by later tomorrow. 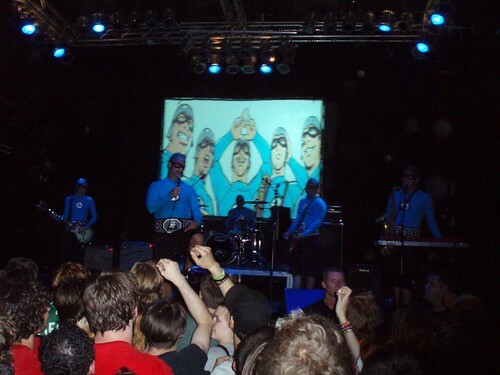 From there I went to “The Aquabats!” concert! They’re a California ska band and easily in my top 1 favorite musical groups. Unfortunately they wouldn’t let me bring my camcorder inside (again) so I had to walk down the street and hide it in another construction vehicle a la San Diego. But once I was in they put on an awesome show and I totally recommend checking them out if you get the chance. It was a REALLY young crowd though; apparently their music is something you’re supposed to grow out of. Oops. We were up front and center getting crushed by waves of sweaty kids and jumping around like we had pogo sticks for feet. Every time I touched another fan (usually out of a desperate desire to protect the poor kid, Lucy, that came with us to the show) it was like sticking my hand in a pond. Once we were back at the house there was a quick round of charades followed by Soccer Jersey Saturday! 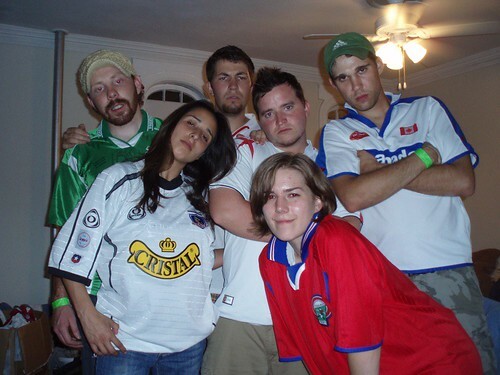 Which mostly consisted of a bunch of people wearing soccer jerseys…plus, you know…it was Saturday. It also consisted of going out and making new friends at the party we crashed and stayed at until three in the morning. Which admittedly made Sunday’s ultimate game a little rough. Fact: Awesome people give away money.